On March 21, more than 200 students, faculty, and community members gathered at the Palace Theater to discuss Drone Warfare: The Implications for Upstate New York. Valerie Morkevicius, assistant professor of political science, and Jacob Mundy, assistant professor of peace and conflict studies, organized the event. Presenters represented a breadth of ideologies on the topic. The event specifically focused on drone warfare within the context of Syracuse’s Air National Guard base. Syracuse’s Hancock Field is home to the 174th Attack Wing. 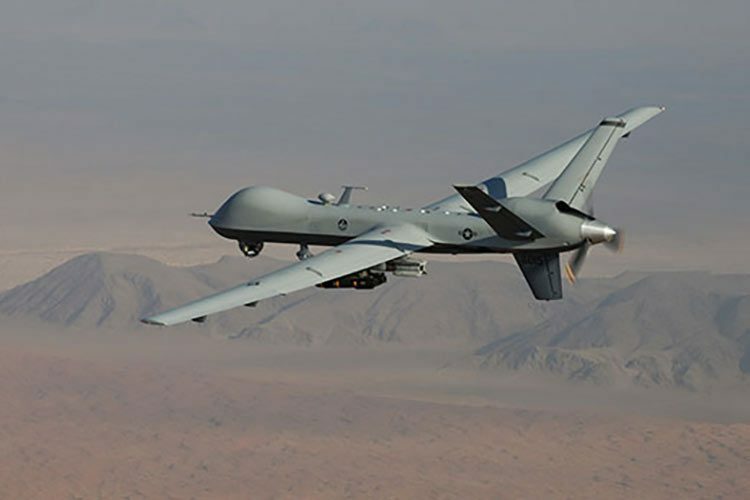 Pilots at this base remotely operate MQ-9 Reaper drones that fly over Afghanistan for the purpose of surveillance and intelligence. Officials state that fewer than 10 percent of missions involve combat. Presenters included Daniel R. Brunstetter, associate professor of political science at the University of California, Irvine; Maj. Gen. Charles J. Dunlap Jr. (USAF, ret. ), professor of the practice of law and executive director of the Center on Law, Ethics and National Security at Duke School of Law; Nicholas Rostow, Charles Evans Hughes visiting chair of government and jurisprudence at Colgate; and Harry Murray, professor of sociology at Nazareth College and an activist with Upstate Drone Action. Although there was no clear answer regarding the future of drone usage by the United States — what it will or should look like — the event shed light on the complex policy, legal, and ethical questions surrounding the issue. “It’s important for you to think about your ethical standards, how they line up with those of others, and whether you would change them in light of new threats,” said Brunstetter. The event was sponsored by the Upstate Institute; Center for Freedom and Western Civilization; divisions of social sciences and university studies; International Relations Program; Kulla Family Fund; Lampert Institute and Center for International Programs; Office of the Provost and Dean of the Faculty; the Peace and Conflict Studies Program; and the Department of Political Science.